As a first time mom, I was greatly looking forward to my birthing time starting naturally! I planned on having a natural childbirth all along and thankfully the hospital I work at had an in-hospital birthing center. (The only one in the state!) I started studying the Hypnobabies techniques at around 28 weeks or so and was really looking forward to labor and a water birth! At my 38 week appointment, the midwives checked me and I was 1-2 cm, 70-80% and my baby girl was low as usual. My due date was July 5th and I knew the next full moon was July 3rd! (I work in the NICU and see often how busy the labor and delivery unit gets around the full moon!) Around 39 weeks (Thursday), I started having some pressure waves but they didn’t stick around. Sunday night I listened to the track “Baby come OUT” just ONE time and went to bed listening to the Joyful Pregnancy Affirmations! On Monday July 2nd, I woke up around 4am realizing I had been having pressure waves and they started waking me up. I finally got up around 6:30 am and started timing my waves (just for fun mostly 🙂 ) They were typically every 3-5 minutes apart lasting around 30-45 seconds, some spacing out to 8 minutes but never farther than that. I listened to my Easy First Stage track and my Birth Day Affirmations a few times. I labored all day with the pressure waves staying in the same pattern, and around 10pm I started getting a little frustrated because they weren’t progressing, but they weren’t stopping either and I had also been losing my mucus plug all day. I called one of the midwives and she said it did sound like early labor and to try to rest overnight and see where we were in the morning. I went to bed around midnight, although sleep was difficult, waking up with each pressure wave. At around 4:30 Tuesday morning I finally got up and moved to the couch because laying down to sleep was getting too uncomfortable. I finally gave up trying to sleep at all and got up around 6:30am. My husband, Nick, got up and went to work to finish a few things he had to get done and I continued laboring at home. My pressure waves were closer to 3 minutes apart, about 30 seconds long. I called the midwives at 8:30, she said it didn’t sound like my labor was far enough along to come in and to labor longer at home. It was pretty easy to get through the pressure waves so I was fine with that. My mom and sister and brother came over shortly after that and Nick came home around 9:30. I did have some slight discomfort in my lower back and I joked that could provide my own counter pressure to take away the discomfort. Around 10:30 I talked to a nurse at the midwives office when it got more difficult to walk and talk through the waves and she said to go ahead and come in. I got to the (hospital) birthing center around 11am, and was disappointed to find out I was only at 3cm although I was 80-90% at least. I labored on the birthing ball like I had at home. My dad and my other sister had come too so we all played a game of Phase 10 in between pressure waves. The midwife came in around 3 and asked me to walk around a while to try to get things moving. I walked around the birthing center and my pressure waves definitely picked up, requiring me to lean on my husband or back against a wall to help with the tightness in my lower back. At 5pm, the midwife wanted to check me again and unfortunately I was only 5-6cm! I was very disappointed hearing this and was surprised my labor wasn’t progressing more quickly. I continued laboring back in my room and this is where time started getting a little fuzzy. 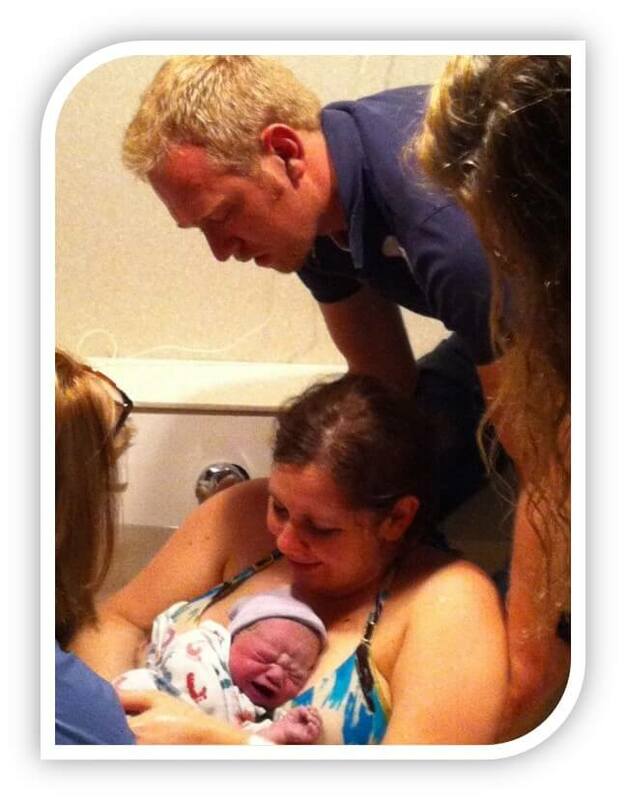 At some point I got into the birthing tub which was as amazing as I had heard it would be! Later in the night I realized I started sleeping between contractions which at times was not a good idea because I wasn’t able to use my Hypnobabies techniques as I felt the pressure waves coming on. I used the Peace and Release cues constantly throughout my birthing time! Around midnight, I asked if we could break my water or something to get things moving more quickly. The nurse got me out of the tub and checked me and I was dilated 8-9cm. The nurse talked to the midwife and reported back that the midwife didn’t want to break my water yet because the baby was posterior! POSTERIOR??? Why are you just NOW telling me my baby is posterior?!?! I knew I had some lower back discomfort like a posterior labor would but it was manageable and not nearly as hard as I had heard a typical “back labor” would be, so I didn’t think she was posterior. So my nurse and I spent the next few hours trying to turn her using various positioning techniques and I tried to really focus on relaxing and visualizing her turning. We FINALLY got her turned using the Rebozo technique! I was surprised we were actually able to get her turned! At this point I was quite exhausted, it was around 3-4 am on Wednesday morning July 4th. I never once felt like I wanted an epidural or that it was too intense or overwhelming for me. I did want it to be over though because I was so exhausted! I asked the nurse a couple times in my daze if we could just cut her out and be done. Obviously and thankfully there was no need for that! They asked if I would like some “therapeutic rest” and I had no idea what that was so I asked. The nurse said “Well, we give you some Nubain and let you get some rest before trying again later”, I immediately said no and continued laboring. At various times through the night I got in and out of the tub and tried many laboring positions. The nurse had me start pushing when I thought I might have a slight feeling to push. She had me make this odd grunting noise during the pushing which resulted in only a sore throat the next day! The midwife and her student came in to check on me asking what I wanted to do and I honestly didn’t know what I wanted to do, I was so out of it. They decided to go ahead and break my water and gave me an IV bolus of fluid since it’d been a long time since I’d eaten anything. Once they broke my water I still had a small anterior lip on my cervix so the midwives left again to let me labor some more. My pressure waves picked up in intensity and frequency, although I still tended to sleep in between. I pushed through a couple pressure waves, feeling her come down and slide back up a little. I held a little pressure to keep her down between pressure waves and pushed her head most of the way out with the next pressure wave. When I saw her head I was like “Oh my God.” as in, wow there really is a baby in there coming out! The fourth pressure wave I was determined to get her head out so I pushed and delivered her head and her little body slipped on out after it and she was put directly onto my chest. I never felt the “ring of fire”. I continued to say “Oh my God.” I leaned back onto my husband’s legs (he had them in the tub supporting me) and just sat there relishing in the amazement of having just given birth to this amazing little baby. We waited to cut her cord until it stopped pulsating, I got out to deliver the placenta and get checked out. My little Ayla weighed 7lbs 15oz and was 20 inches long born at 6:05 on the 4th of July! I had a wonderful experience giving birth surrounded by lots of loving and supporting family! (I had around 8 people attend my birth not including the staff!) I had a small tear requiring one stitch and some small lacerations just inside the vaginal opening that they weren’t worried about. I laid skin to skin with my new sweet baby, breastfed her and settled in with my husband for a little shut eye!!! It was wonderful!! !